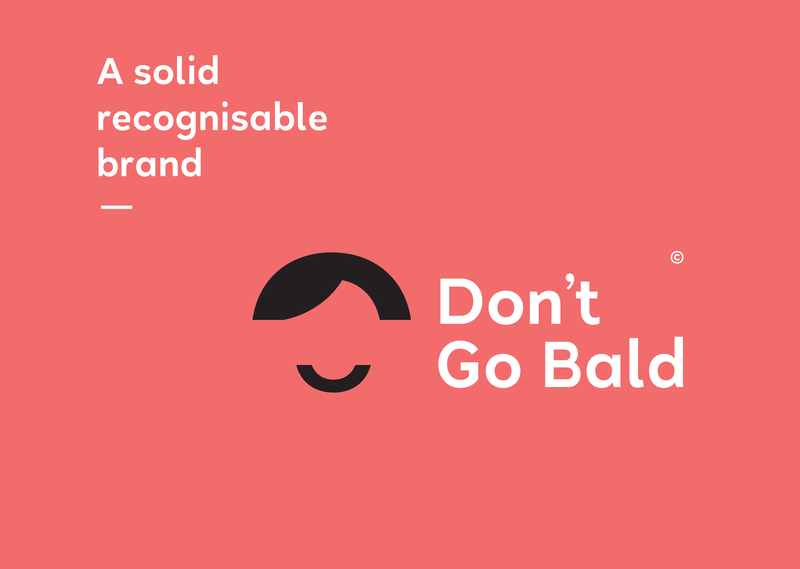 Recently we designed a comprehensive brand identity and website design based around the name “Don’t Go Bald”. The aim of the project was to take away the stigma of having hair transplants. 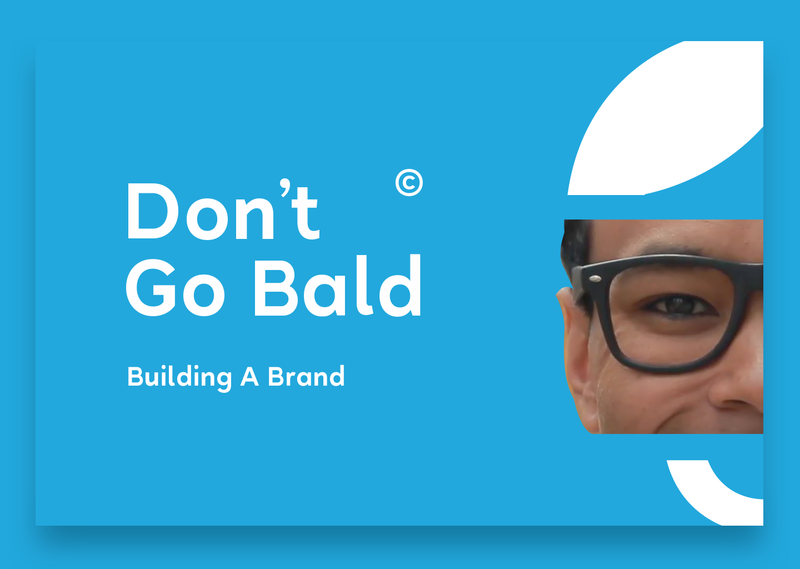 We wanted the brand to be playful but not insulting or harmful to anyone going through the hair transplant process. During our research phase we found that most surgeries that offer hair transplant procedures look very similar to each other, all looking very clinical with lots of white and splashes of blue. However with this clinical approach we determined that it could be quite off putting to someone who’s already feeling nervous about having hair transplants in the first place. This is a direct issue that we were looking to address. Off the back of our research we knew that we wanted to create something inviting and friendly, something that would put those who are nervous or second guessing the procedure at ease. 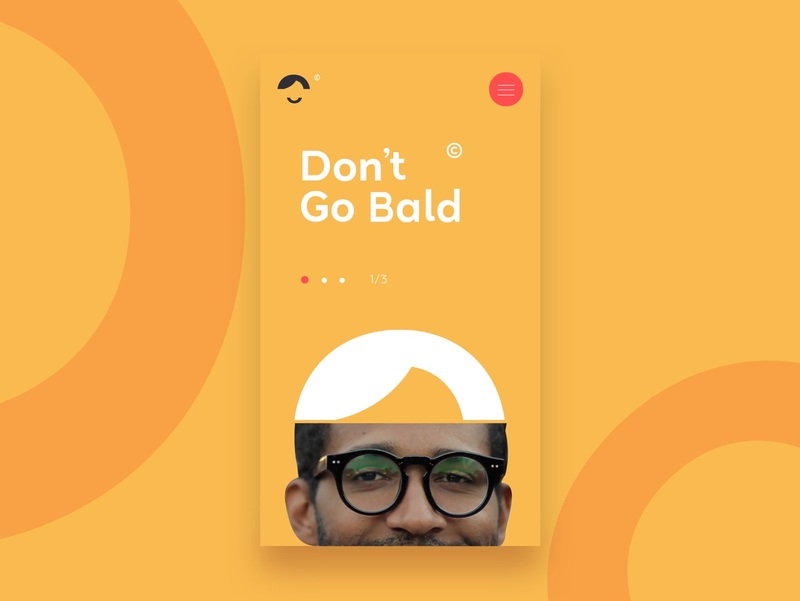 Our plan was to inject positivity into the brand, showcasing happy faces, bright colours and stories of people who have gone through the procedure and improved their confidence with don’t go bald. For every brand design project, the main challenge is creating a brand that will not only look good, but will also showcase the company. When creating a brand identity it’s important to keep what the company does and what they’re trying to achieve in mind at all times. You should reflect what their service are within their logo if possible. At the start of every project the process begins with a digital mood board, this is something we’ve incorporated through-out every aspect of design within KIJO. To create the mood board we load up invision app and start a new board, we then pull in everything that can inspire, direct or positively influence the design style going forward. 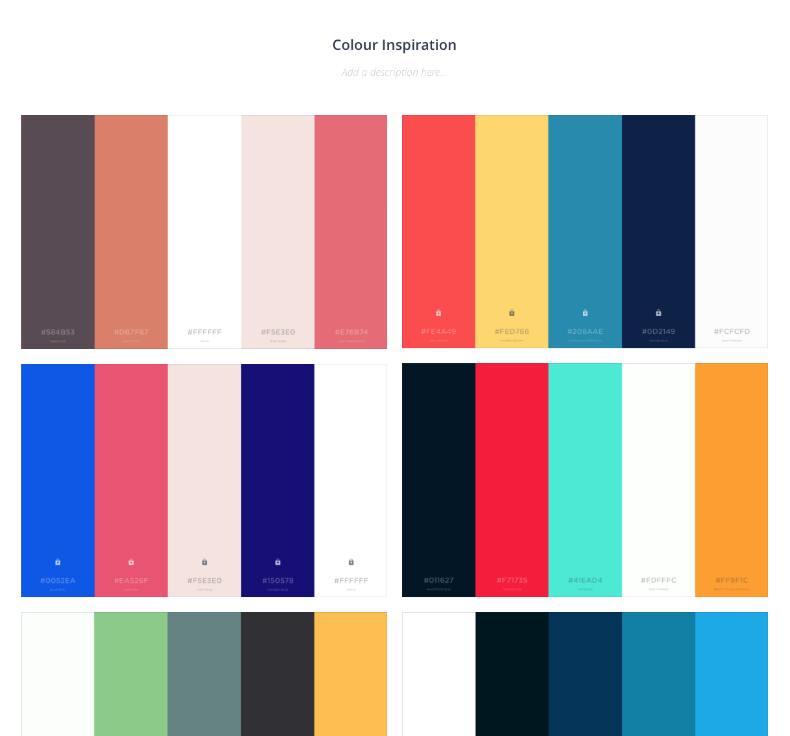 This can be anything from key words & colour pallets to logos, images & typography. The purpose of this is to get into the mindset of the brand before we even pick up a pencil or mouse. Once we’ve generated a mood board, we use this to move on to the sketching phase. We pick up a pencil and paper and begin to draw out ideas while referencing the mood board, this keeps the brand fresh in our minds. When I personally sketch things out i’m not looking to make it 100% accurate to the final product, the goal is to be loose with your drawings and refine it later when taking the branding project into the graphic design stage. People are often put off having hair transplants because of the stigma around it, the process can be seen as non-masculine. This campaign was all about promoting positivity around the procedure so I wanted to go for something fun and playful. However I know that there’s a fine line between fun and mockery; I needed to be careful not to trivialise the brand. The way we resolved this was the way the branding was physically used. 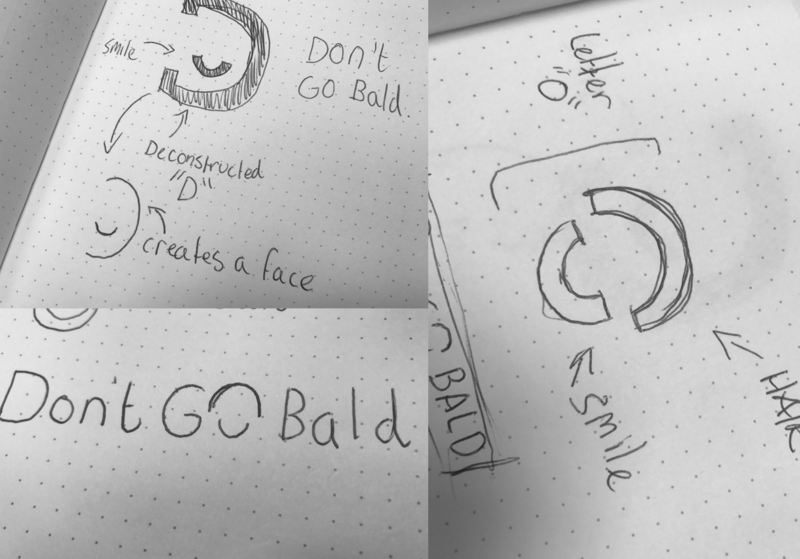 We promoted the imagery of smiles by generating a new icon-based logo that included hair and a smile. 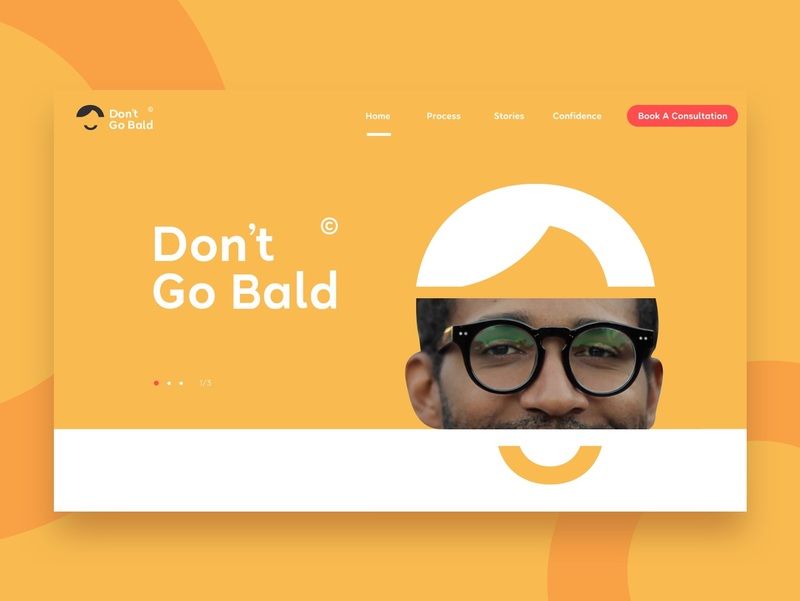 We took the smile and hair from the logo and cut it with images of happy looking people, symbolising that Don’t Go Bald can improve your happiness. The next step was the colour palette. When you think of happy colours you think bright and bold. We went with a palette of yellow/orange, blue and a reduced red that is almost salmon coloured. We reduced the red in the pallet because although we wanted bright and bold we didn’t want it to come across as aggressive. 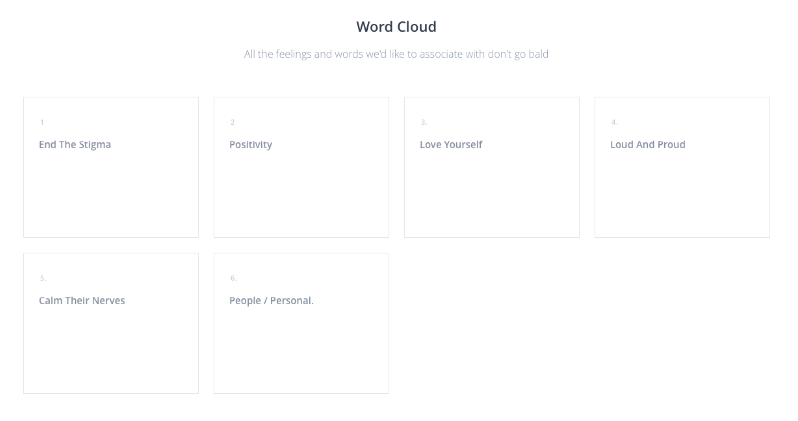 The brand needed to be about happiness and calming the nerves of the customer. It’s often forgotten that a brand is not just a logo; it’s the entire essence of the company from logo, to colours to tone of voice. But how do you showcase the full potential of a brand to your client? It can seem like a daunting task. 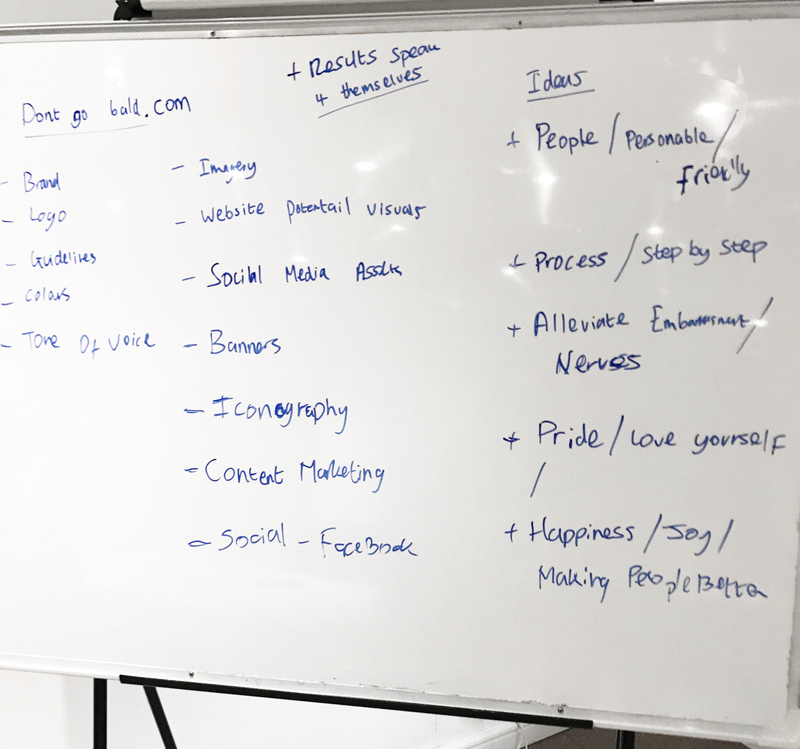 To tackle this I created lists on a whiteboard and paper (the old ways are the best), running through everywhere that the logo or brand might be seen. This included things like websites (mobile and desktop), social media, images, banners and more. 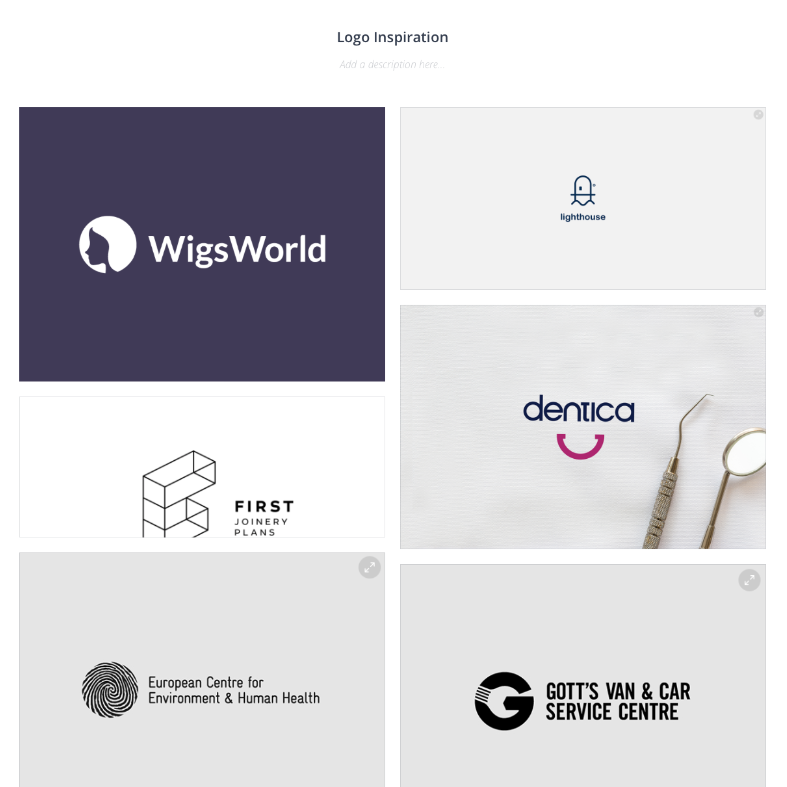 After compiling this list I began the process of creating imagery to send to the client, alongside the standard brand guidelines document and usage details. 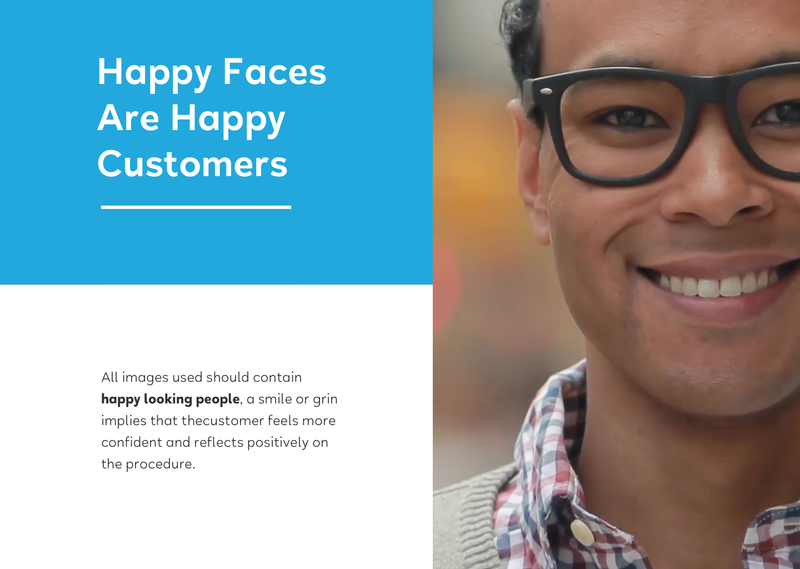 One of the first things generated was an example header for the website ““ a strong image that could showcase both the brand and the goal of producing happy customers. I took the previously mentioned collage style image and played with the platform it’s displayed on. 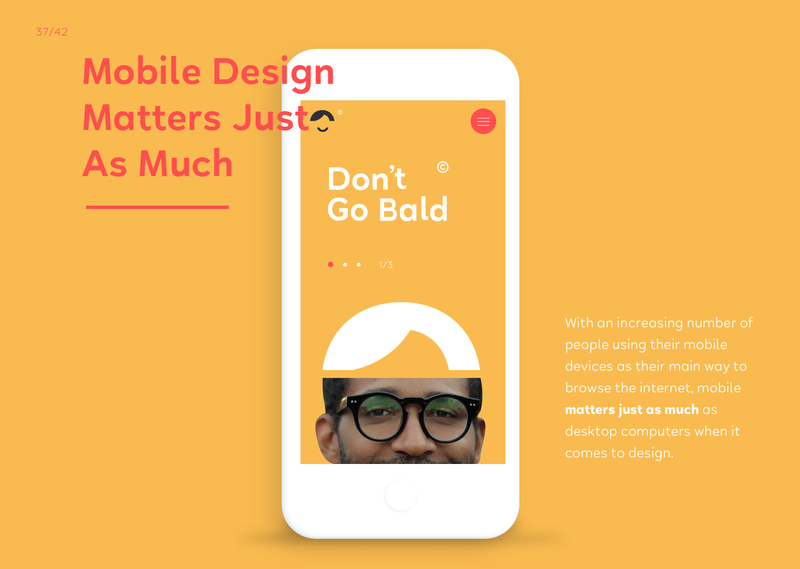 The banner is designed to be full screen, with the hair from the logo’s icon sitting on top of a happy person’s head and the smile sitting below the fold. As you scroll, an implied message is revealed: our procedures will make you smile. Other images I created included mobile versions of the website banner, content sections, images and content marketing. We went all out with this document to show how the brand could be used on all platforms in a strong and engaging way. The easiest part of this project was showcasing the ideas. Our research and planning stages really helped the rest of the project flourish, our visuals felt solid because of the foundations we built them on. On the other hand the hardest part of this project was showcasing this in an effective manner to the client, we really wanted to drive home that everything in the project was done with purpose and everything had a reason or meaning behind it, finding the correct way to display this was key. To solve this we generated a large in depth brand guidelines pdf. We ran through the process from start to finish, presenting each element in a visually stimulating way, making sure that every page was in the new brand’s style. 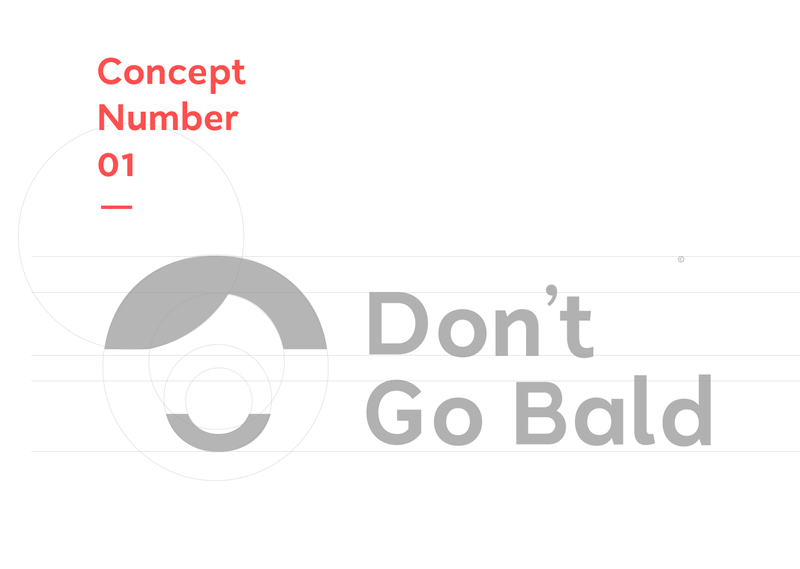 The final logo design we picked displayed the exact feel we wanted to reach with the new Don’t Go Bald brand. We went with the rounded hairline and smile logo, our reason for picking this was the flexibility in it’s usage and the rounded friendly feel. 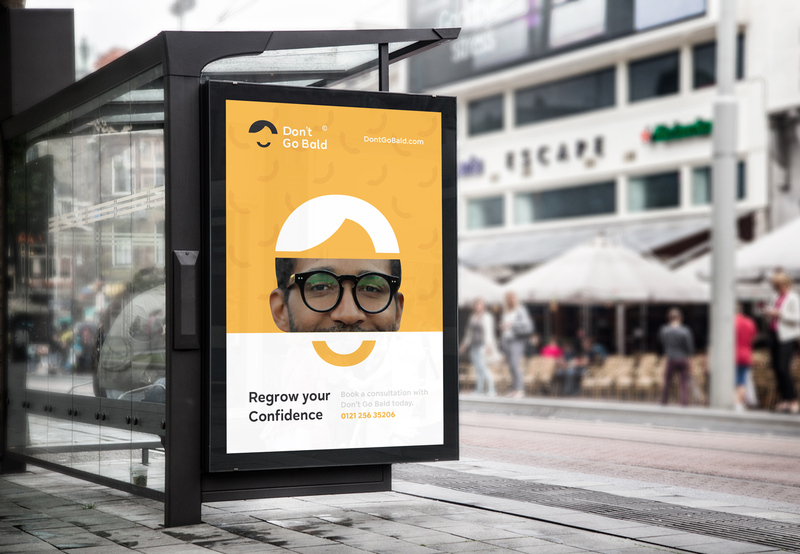 We had the ability to partner this with images of real happy people giving amazing potential for future brand assets such as posters, advertisements and more. We were able to generate a full bespoke brand with website design examples and a large-scale document which met the brief very well. Whilst producing this we learned valuable lessons and designed a new brand guidelines and proposal system for showcasing our work in the future. This is something that we are now able to take forward as a team and showcase in future projects. We now use this proposal as a prime example of a strong brand identity and are excited to share it across our social media platforms. We believe this project hit the nail on the head when reflecting back on the brief, our concepts feel inviting while remaining professional. Want to look more in depth? See the Brand Guidelines. Need help creating a new brand identity? KIJO is brand design agency with a difference. Get in touch today.